Today, everyone is multitasking. 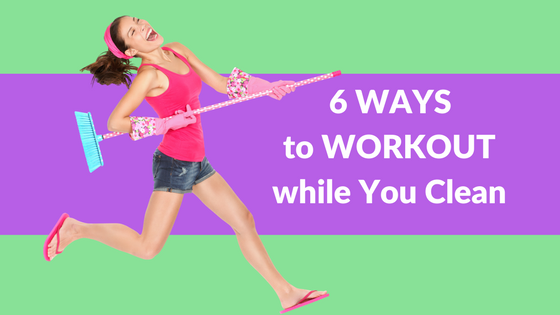 Here are 6 ways to get your workout on days when you have to choose between going to the gym or cleaning the house. As you wash dishes, stand with your legs hip-width apart and do calf raises. Move up onto your toes for 5-10 seconds, and then slowly come back down. Make a playlist with 30 minutes of upbeat music. Start on one end of the house and go room-by-room cleaning as fast as you can to try and beat the clock. This will really get your heart pumping, but I do recommend closing the blinds so the neighbors don’t think you’ve gone crazy. When speed cleaning, I’d usually recommend separating items that need to go upstairs into piles to make one single trip, but when exercise is your goal, feel free to take a few things at a time. The more times you run up and down the stairs the better. As you vacuum, your arms will move back and forth, but that doesn’t have to be the only part of that’s working out. Flex your abdominal muscles, and challenge yourself to keep them flexed as you vacuum each room. Switch up the workout every few minutes by doing some lunges as you push the vacuum forward. You can get some great muscle work in when you sweep and mop the floors, but actually getting down on your hands and knees and scrubbing your floor makes for a really intense arm and shoulder workout, plus some really shiny floors. Make sure you switch sides often so that you are working both arms evenly. As you dust or clean windows, the motion will give you a great arm workout. Stand up straight and reach those hard to reach areas at the top of the shelf or in the corner of the window and work your abs and glutes at the same time. Want an even easier way to have a clean house and get a great workout? Just head to the gym and let a Winnipeg cleaning service handle the cleaning for you! Are you a fan of multitasking? Leave us a comment to let us know your favorite way to kill 2 birds with one stone!